In short, this song carries with it heavy dose of Buddhist and Taoist teachings which tell us that everyone falls into the trap of fame and money and into the binding of blood relationships. There is no exception. The book “Numbers and Roots of Numbers in the Bible,” through a simple cover design presents with clarity and simplicity the relations between nine basic numbers and their nine numerical roots. 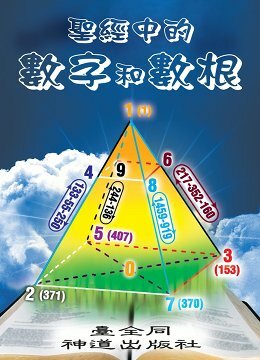 The numerical pyramid on the cover vividly lays out the numerical root of (217_352_160) before everyone the “circle” of fame, money and blood relationships that one one can get out. However, we should not talk in theory that “well” is “done” and “done” is “well” because talking is no use. The focus of the matter is, what can be done in order to help us to walk out of the cycle of (217_352_160) that each number is circulating to another number within the cycle without stopping? Although all religions or philosophic teachings are trying high and low to find the correct answers, however, without the intervention of the Holy Spirit and the revelations from God, perhaps no one can approach to, understand and accept the answer to this question. When Jesus was preaching on earth, He said many things to His disciples. All His sayings point to one common focus: in order to walk out of the circulating numerical root of (217-352-160), one needs to believe into him, that is to enter into a stage of being with him and walking with him, which is represented by the non-changing numerical root of 407. “Men long to be immortal and say well to be won” — in terms of Christianity, everyone is pursuing an eternal life as his or her goal and hope, however, only those who could get out of the circulating root of (217_352_160) and enter into 407 can truly touch the essence and reality of the eternal life. Note 1: This article was received from a reader after reading the book “Numbers and Roots of Numbers in the Bible” published by TheoLogos Publications. To encourage readers to share more of this type of articles but at the same to allow them to remain anonymous, any reader can choose to use a pseudonym or number to represent him or her. Note 2: To find out how the unprecedented discovery of the three-element circulating “numerical root” (217_352_160) was made, please read Taichuan Tongs’ new book “Numbers and Roots of Numbers in the Bible.” published by TheoLogos Publications.